How to Select the Best Gas-Powered Chainsaw? Selecting the best gas chainsaw for the money takes time, research and a little forethought. There are many things that need to be factored into your decision, such as those below. Buying a gas powered chainsaw is not a decision to make lightly. It’s a large sum of money to outlay so you need to be sure you make the right decision. Is it going to suit your needs? Is it the right size for your space and requirements? When choosing a gas powered chainsaw, you need to ensure you buy one that is going to suit your needs well. By reading buying guides, online reviews and doing your own research, you can find the best gas powered chainsaw for the money. Are you a home gardener, lifestyle block owner or just have a few trees? Are you a forest industry professional in need of a commercial grade gas chainsaw? Gas chainsaws aren’t for everyone, but you certainly learn that by reading this buying guide. Your safety – whether it’s in the workplace or a home environment – is very important. Many gas chainsaws offer a range of safety options, and it pays to be aware of most, if not all, of them on different models in the market before you make your decision. There’s no point in purchasing a heavy duty gas chainsaw for one fruit tree, nor is there much reasoning in getting an electric chainsaw for an entire forestry block. You need to find a chainsaw which will suit your needs perfectly and will be the most efficient tool for the job. The great thing about gas chainsaws is their ability to be suitable for a large range of jobs. They can undertake small household tasks with ease, or large scale jobs that require a bit more effort. Manufacturers are lifting their game with each new model, and it’s little wonder you will rarely find a gas powered chainsaw that isn’t suitable for the job at hand. Low emission engine for more efficient use. Electronic ignition systems to make for an easier start. Automatic chain oiler so you don’t need to remember to oil it manually. Anti-vibration to reduce user fatigue. Balance so all weight is distributed evenly for easier use. Chain break to stop the chain spinning if you hit a snag or experience kickback. Top handle for ease of cutting downwards. Cleaning the air filter to make sure there’s no blockages. Tightening loose screws, bolts and nuts. Cleaning the flywheel cooling fins. Topping up fluids such as fuel and oil. 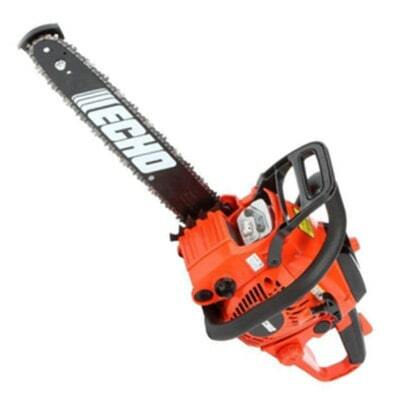 Gas powered chainsaws are becoming more and more affordable as more brands come onto the market. It’s a competitive market and this benefits the consumer as more features are being offered for less money. It will pay to work out the features you require, as this will enable you to narrow down your chainsaw preference. From here, you can choose the most cost-effective option. When you’re preparing for the cold winter ahead or you’re clearing a section, you couldn’t get a more perfect outdoor tool for the job than a gas or petrol powered chainsaw. They’re not only robust, but they’re hardy and ready to cut through the toughest of logs. Extended use in harsh climates. Gets big jobs done with ease. Can be used in a variety of settings. Use of them can be messy. Maintenance can be hard work if you don’t know what you’re doing. They need a range of different liquids to keep them running. When they break, they break very well! Gas or petrol powered chainsaws are in their element when used for large jobs. They love sinking their teeth into forestry blocks, lifestyle blocks, farms, commercial grade projects and tasks which require professionals. They are not well suited to small urban properties with smaller trees and where noise complaints are an issue. Gas powered chainsaws have many maintenance requirements. You need to firstly ensure you are maintaining the fluid levels of the fuel, oil and lubricant. You also need to keep the chain sharp. This is not only for making your job easier, but for safety reasons as well. The sharper it is, the less kickback you will receive on a straightforward cut. This also includes cleaning debris out of the chain and filing the depth gauges to a level needed for cutting hard or soft wood. Once your chain is below 4mm, it’s time for a replacement. These are not expensive to buy. Chainsaws also get dirty relatively quickly. Remove the clutch cover to clean brake bands, clean the bar, scrape out any debris, wash air filters, clean the cooling fins and air intake, and check the flywheels for blockages. When well maintained it starts within 2-3 pulls when cold. Is reliable on an entire day’s job. It has plenty of power for almost any standard tree. It can be more affordable than other leading brands. When the chain falls off, it’s more than likely going to bend and no longer be usable. The piston rings can get clogged with carbon. Replacement parts don’t always fit your particular 455 as they continue to upgrade the same model. QHow much oil do you mix in with one gallon of gas? QDoes it come with an automatic bar oiler? The Husqvarna 455 Rancher has to be one of the most reliable gas powered chainsaws on the market to date. It’s from a reliable manufacturer, is a tried and true model, and the cost is in proportion to all the features on offer. Not only has Husqvarna reduced their emissions on this model, but it also offers reduced vibrations, better starting operations and a centrifugal air cleaning system. Whether you’re out on the farm or just have a few logs to cut for your winter wood pile, this chainsaw can get it done. Check out what other people who purchased this product think about it. 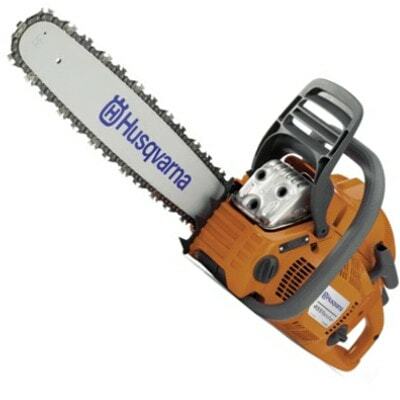 Read Husqvarna 455 Rancher gas chainsaws reviews. It’s light which equates to less muscle fatigue. It handles most big cutting jobs with ease. It doesn’t have a high output oiler. It’s very inefficient with fuel usage. It runs hot and needs a lot of down time between refuelling. The plastic components feel cheap. A11.02 x 10.04 x 15.16 inches. QHow long is its chain? QDoes it have automatic chain lubrication? QWhat kind of engine does it have? A62cc air cooled, two stroke. The TimberPro 62cc gas chainsaw is a cost-effective option for those not looking to outlay a lot of money. For the price though, you do get a lot of bang for your buck. Some components look and feel cheap, but where it counts, everything looks good and works well. It’s a very reliable saw when it comes to those big wood cutting jobs, but its fuel consumption lets it down. Overall, for its cost and the accessories that come with it, this gas powered chainsaw is a great option for any home or business owner. Check out what other people who purchased this product think about it. Read TimberPro gas chainsaw reviews. It has an extraordinary 7 year consumer use warranty. It starts and runs well. It has a decompression valve to help with starting. It has an adjustable oiler for user convenience. It heats up and shuts off on larger jobs. It’s underpowered for larger limbs. 18 inch Oregon bar and chain set. A13 x 20.9 x 11 inches. QWhat is its bar and chain length? QWhat kind of fluids does it require? A50:1 gas and special 2 stroke oil. 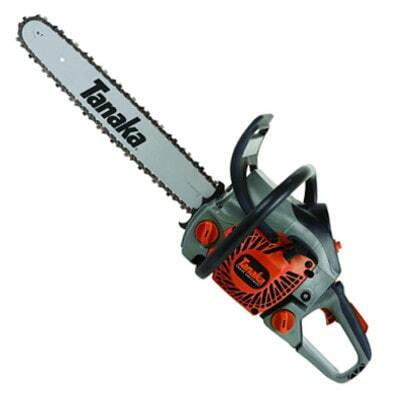 For homeowners and those who will only need a chainsaw very occasionally, the Tanaka is a good option. However, it’s lacking power and reliability in order to handle bigger jobs. Some users note components appear cheap, and it can overheat very quickly. It’s a sturdy chainsaw to say the least, but its cost can ultimately reflect its lack of features and reliability against others in the market. Check out what other people who purchased this product think about it. Read Tanaka TCS40EA18 gas chainsaw reviews. It starts almost immediately from cold. It has sufficient torque and power. The chain tension holds well. If you need to adjust the high speed needle valve, you need a special tool not sold to the public. It overheats with larger jobs. A28 x 12 x 12 inches. QWhat is the bar and chain length? QWhat is the fuel tank capacity? With its anti-vibration handle, chain brake and tool-less chain tensioner, the Ryobi is good value for money. Although it’s not a great machine for large jobs, for those small to medium sized cutting jobs it certainly fits the bill. It’s also very affordable for those looking for something to potter around with at home, and has no major faults picked up by consumers. 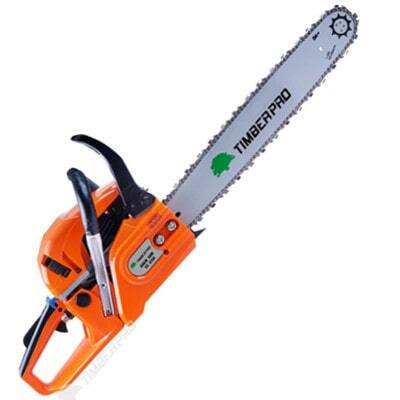 Overall, it’s a top rated gas powered chainsaw for the money. Check out what other people who purchased this product think about it. 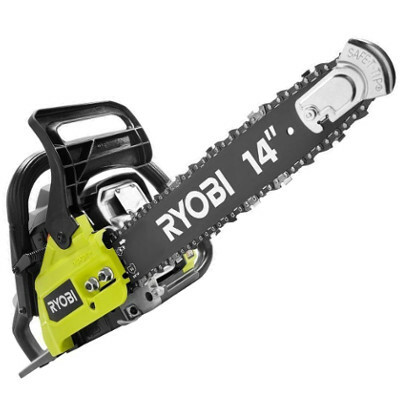 Read Ryobi RY3714 gas chainsaw reviews. It has the i-30 starting system which helps start it more effectively. Very lightweight for being a professional saw. Cuts through hard wood really well. Issues have been noted with the chain tensioner. It can run quite rough, not making nice cuts. Some users battle with it stalling constantly. Users have had trouble with seizing. A12 x 11 x 32 inches. QWhat size is the bar and chain? QIs this for around the home or for professionals? AIt’s aimed at professionals and is classed as professional/commercial grade. Making a comparison between the price and the quality, the ECHO is in the middle range. Although it cuts through wood with ease and starts well, many people have noticed problems with the idling, stalling and loosening of the chain. It would make a great ‘occasional’ saw, but for its price, it’s more directed towards the ‘main saw’ market. Giving it credit where credit’s due, it has great performance with its 40.22 professional-grade, 2 stroke engine. If you are interested in this type of a chainsaw, you would love to read this full buying guide on how to select the best gas/petrol pole chainsaw for the money including reviews & comparison. More flexibility with what you can and can’t trim and lop. More power for those larger jobs. Larger reach – you can take this chainsaw anywhere because it’s not restricted by electricity. The large amount of maintenance required. Gas powered chainsaws can be heavier than electric which makes it harder to find the equilibrium on a pole or stick. The great thing about gas or petrol powered pole chainsaws is their flexibility with application. Whether you’re a homeowner doing general maintenance, or you’re a professional needing a commercial grade chainsaw, the petrol powered option is top rated. It gives you the ability to go anywhere without the worry of finding an electricity source. Maintenance on a petrol powered pole chainsaw is nearly the same as a standard gas powered chainsaw – except for the pole. If maintenance is undertaken correctly, your chainsaw will last a very long time and will give you reliable service. You need to maintain all fluid levels of the fuel, oil and lubricant. You also need to keep the chain sharp and clean debris out of the chain. You should also undertake preventative maintenance such as cleaning filters, bars, cooling fins and brake bands. Homeowners will find very little need for a concrete cutting gas or petrol powered chainsaw, but it’s a huge market in the commercial industry. They cut through concrete with ease and often use a diamond chain for a more effective cut. If you are interested in this type of a chainsaw, you would love to read this full buying guide on how to select the best concrete-cutting chainsaw for the money including reviews & comparison. Being safer and less expensive than a hydraulic concrete cutting chainsaw. Being far more accurate when cutting through asphalt or concrete. Not being suitable for enclosed spaces. They are expensive to buy, maintain and buy parts for. Concrete cutting petrol chainsaws are used largely in the commercial sector as a commercial grade product. They are used for roading, public infrastructure and for new home builds which require an architectural point of difference. Because parts and new concrete cutters are expensive to purchase, maintaining your concrete cutting chainsaw is very important. Use a pressure washer to remove build-up, keep blade shaft bearings lubricated, check the oil, maintain all tension in the belts, replace, clean and check air filters, and make sure the water delivery system is free of any dust, dirt or grime. Where to Buy Gas/Petrol Chainsaws? When you’re after the best gas chainsaw for the money, your best option is to head to different websites online. Amazon is a great option for getting that new gas powered chainsaw at a competitive price. Often when new models are coming in is when you will get the best deal. You can also buy professional, commercial and basic chainsaw models at your local hardware stores.